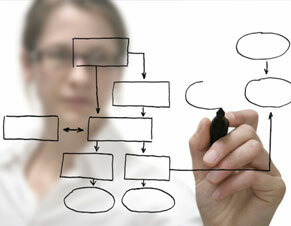 Could you draw a diagram of your company’s manufacturing or marketing process? Probably, you could. Could you draw a diagram of your company’s innovation process? Perhaps not. Some people doubt the possibility of an innovation process. They think that innovation just happens. It can’t be managed, much less turned into a repeatable process. Sorry if you think so, but that is a myth. Other, similar myths are also harmful to innovation. Companies that believe those myths create innovation processes that don’t achieve world-class results. Employees submit ideas. Managers review them and then do nothing to take them forward. Management invests a lot of money in an idea management platform. At first, a lot of ideas are posted. Six months later, everyone has forgotten that the platform exists. Innovation is added to the company’s list of values. Employees attend mandatory innovation briefings. After the briefings, everyone returns to his cabin and works exactly the same way as before. managers are not comfortable with the uncertain return on investment, so the projects are not funded. An idea management process is put into place. The innovation leaders write a 20-page guide for the process. The new product teams struggle to adopt the process because it is very complicated. Companies that are world-class innovators have innovation processes that are based on truths, not myths. Their processes enable their employees and managers to create world-class solutions repeatedly over years. Want to know how to design a world-class innovation process in your company? Contact us now to start the dialog.